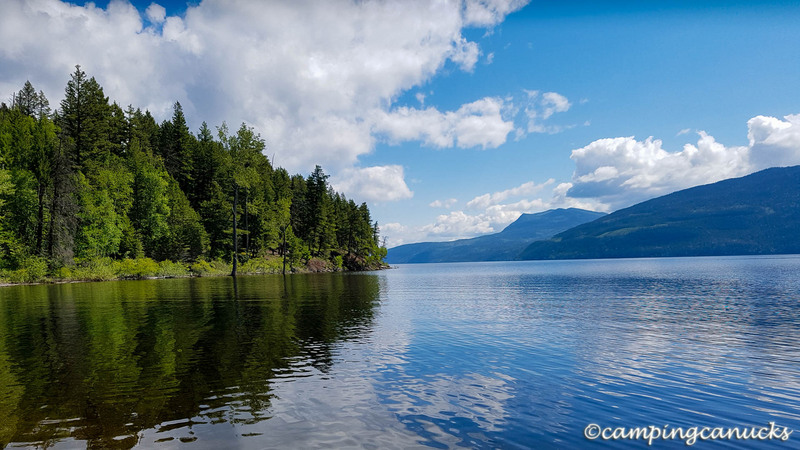 Having paddled Clearwater Lake and Murtle Lake in Wells Gray Provincial Park over the years, we picked a Victoria Day long weekend in May 2016 to paddle Mahood Lake in the western part of the park. Mahood Lake is not accessible from the east but can be driven to on the west side by several different routes, depending on where you’re coming from. 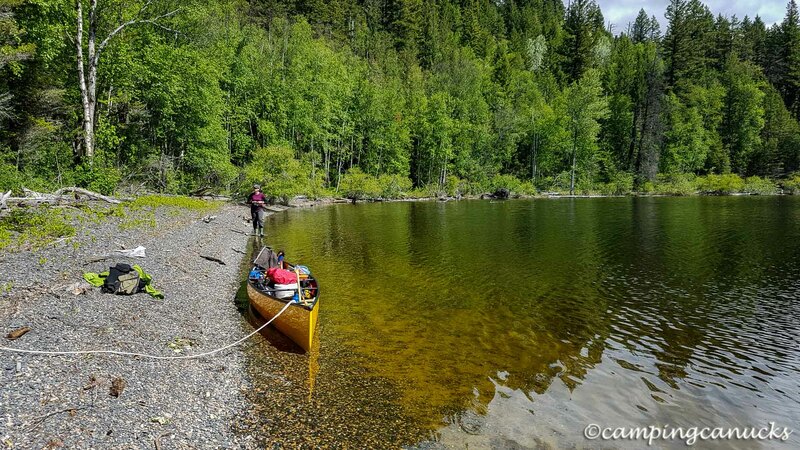 Probably the most popular way is via 100 Mile House, but we chose to approach from Clearwater and follow a network of logging roads until we reached the park and the lake, where we spent the night at the frontcountry campground. With the May long weekend’s notorious history of rain in the region, we well prepared ourselves for three days of paddling in bad weather. Our plan was to get to the far end of the lake on day one – which is about 22km – camp, and then move back west to another camp along the northern part of the lake on day two, and finish the trip on the third day. We started our day early on a Saturday and were on the lake by 7am after putting in from the boat launch at the campsite. There was ample parking there for vehicles and several signs to notify the park attendants of your expected return, just so they know that you’re on the lake and not just a day tripper. There were also several signs warning of adverse weather conditions including waves higher than a meter if the wind is really blowing hard. In a canoe, or kayak, or any boat for that matter, that is something to take very seriously. 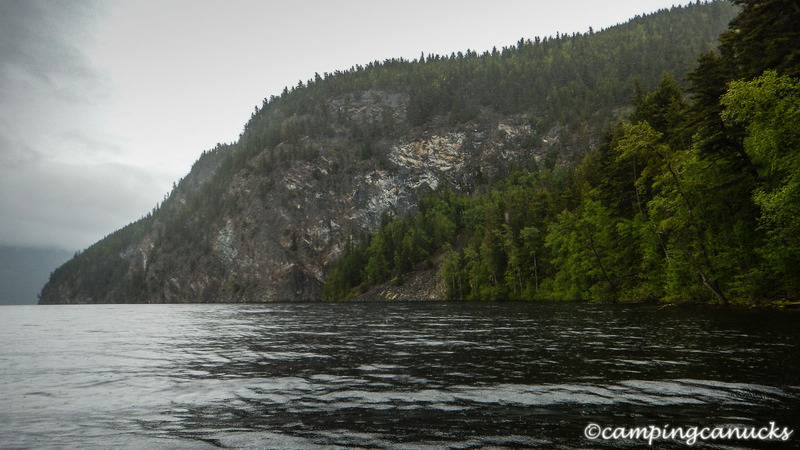 For the first couple of hours it was only chilly and cloudy, and we were able to paddle easily along the southern shore, making stops here and there to grab some geocaches and eat some food. We only saw one boat fishing on the entire length. However, as the morning progressed, the rain began as we stoically paddled on, well protected by our rain gear and layers of clothing to keep us warm from the bitter wind blowing on the lake. Luckily, it was a tail wind and helped push us along but we knew that at some point, we would be paddling against it on the way back. The southern side of the lake is not in fact in the park so there are cabins and houses along the way here and there. Eventually though, the southern side becomes too steep and there is a long stretch with no shelter or places to pull out in bad weather. But at this point, we were still being pushed along by the wind and big rollers and didn’t have to stop anywhere. Getting nearer to the eastern end of the lake, we once again came upon private cabins that are only marine accessible. There were no signs of anyone around as we continued on our search for the backcountry campsites at the end of the lake. By this time of the day, we were now getting some pretty big waves and white caps and the paddling was quite hard and challenging as we reached the end. 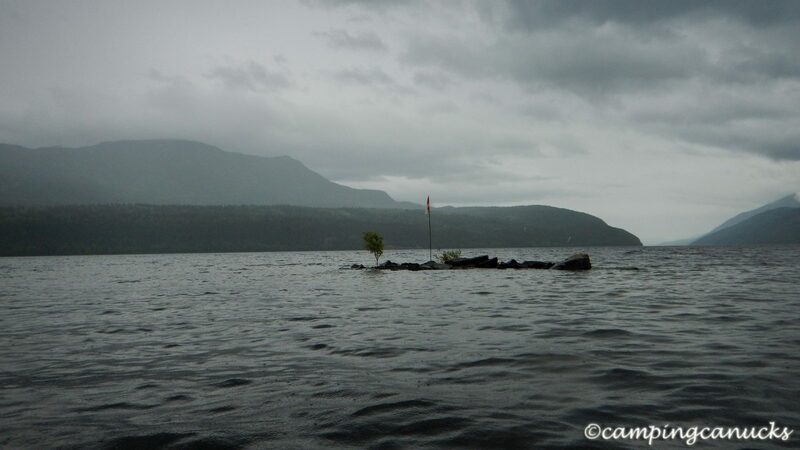 We were at the point of having the wind and waves hitting us from the side, and as anyone can testify who has paddled in bad weather, we had to be careful on how the big waves were hitting us so that we didn’t capsize or get swamped by the whitecaps. And another risk at the far end is the outlet, the Mahood River, of which there are warnings at the launch to not approach as it’s a very fast and dangerous river. The signs at the end of the lake, though, are so old and faded, we were practically on top of the river before we even knew it was there. 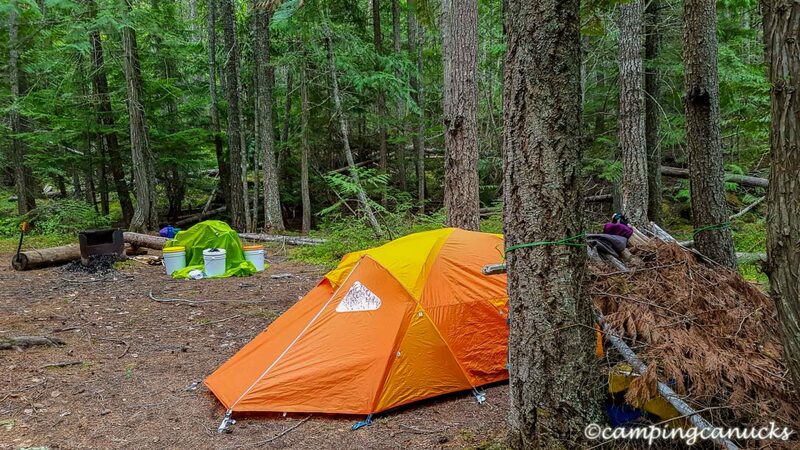 We had paddled past the South Outlet camp, having spotted the outhouse, but we wanted to check out the North Outlet camp before deciding where to spend the night. There were a few white knuckle moments paddling past the outlet with the wind and the waves pounding at us until we reached the north camp. With the beach being quite steep and rocky, we had a rough time getting ourselves and the canoe onto the beach and out of the water with the waves pounding on us. We did a quick survey of the site, but because of the strong wind blowing, decided to put back on the water and go over to the southern camp and hope it was more sheltered. It was too bad, because there was a nice looking picnic table and partial cooking shelter that would have been nice to use. On the way back over to the south camp, we gave ourselves more distance between us and the river until we reached the other beach, where we once again had a rough time getting out of the water due to the pounding waves. The south camp is located about 50 meters from the beach and we were relieved that it was much better sheltered. The only thing missing was a bear cache (the brochure claimed there was one) we couldn’t find but that wasn’t a big deal as there were a couple of trees to hang our food from for the night. Surprisingly, the rain stopped once we were at the camp and didn’t resume until the next day when we were once again paddling. 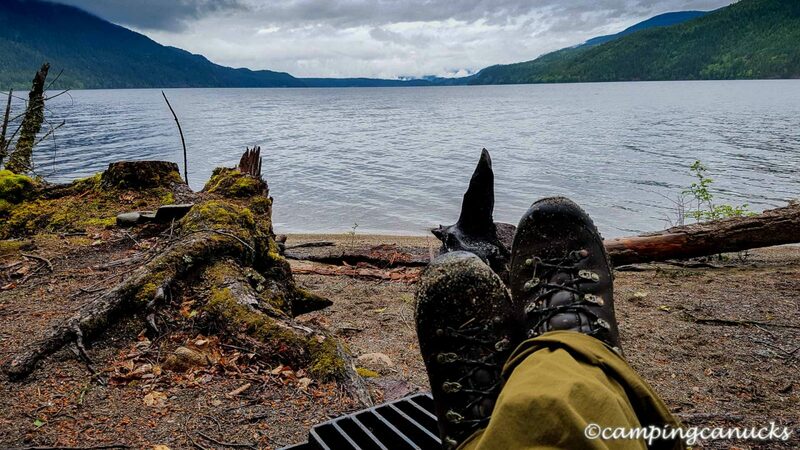 It was nice to be able to camp and cook and not be rained on the whole time and not have to pack up wet gear. And being that we once again had our trusty canoeing cooler, steak and salmon with vegetables cooked over an open fire was on the menu for our first night. We settled in for the evening with some concern about whether we would even get off the beach the next day or if it would be too rough to try to paddle to the next camp. That evening, we heard a motor on the lake and walked down to the beach to see what it was. It turned out that people who owned one of the cabins at the end had seen our canoe on the beach and were checking on us. It was quite nice of them to do so but we informed them that we were OK and would probably be leaving in the morning, weather permitting. They told us that if we needed anything to come to their cabin and we parted with a wave. It was nice to know that someone was nearby in the event we were stranded at the camp for any length of time. There is a trail from this site that goes to Sylvia and Mahood Falls but we decided that we weren’t up to the hike after the day and left it for another time. We did grab the geocache at the camp though. It was another grey, cloudy, and windy morning the next day but luckily, it wasn’t raining. We made some breakfast, packed, and decided that we would take our chances on the lake. Just getting back onto the water, though, was a challenge as the waves crashing on the beach were still quite intense. Eventually, we were able to time the incoming waves and push our canoe back into the water between the big rollers. We were off to the camp on the north side of the lake, we hoped. We were now paddling against the wind of course, but we made reasonable time and once we were a short ways up the northern side, the wind and the waves abated a bit. We estimated about two and a half hours to the next site, so we kept a close eye on potential camping areas each time we passed the scattered beaches along the way. We stopped for lunch at one of the beaches, where we ate huddled under a tree, and continued west until we came upon the Travertine (also known as Candle Creek) site in the early afternoon. It was still raining as we stopped so we took advantage of a home made picnic table at the site and set up a tarp so that we had a dry place to cook and eat. Before long, though, the rain stopped and we did not see any more for the rest of the trip. The site was in pretty good shape, aside from the fire pit, and did have both an outhouse and a bear cache. We cleaned out the fire pit and again had dinner cooked on an open fire. This time we went with the easy dinner of smokies and beans for the second night. 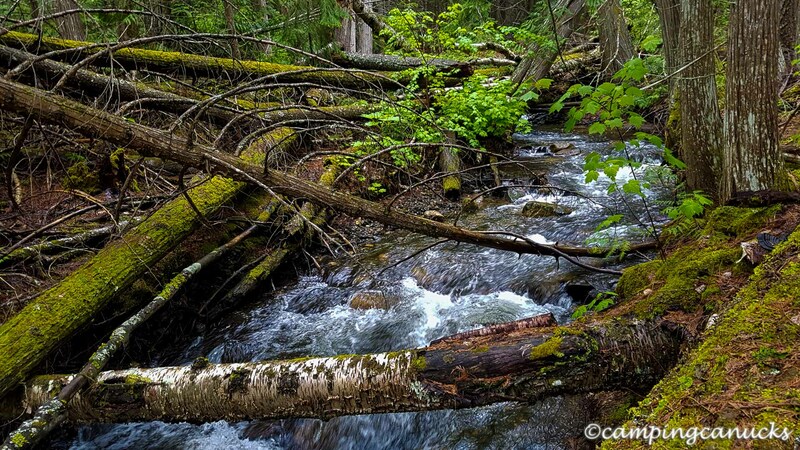 Being that we could hear a creek nearby, we did some bushwhacking until we came across Candle Creek on its way to Mahood Lake. Our third day again started off cloudy with no rain. With breakfast and the packing up, we were on the water by 9am for the last leg back to the camp. Having had a couple of days of cold weather, we were well bundled up against the wind and the cold. It wasn’t long, though, before the clouds started to part and we actually started to get some real sunshine. We had to laugh as it seemed typical of a May long weekend in that it always seems to get sunny on the Monday at the end of the trip. The water was now calm and there was no wind and we leisurely paddled our way onward to the western end of the lake. We made a lunch stop at wonderful little cove near Deception Point, where Deception Creek flows into the lake and stripped off some of the layers we had against the cold. It was nice enough to make us wish that we had another day on the lake. It was another hour from our lunch stop before we reached the boat launch where we had started two days before. All said, we paddled just shy of 48km on our trip around the lake over three days. We really enjoyed Mahood Lake even with the bad weather. 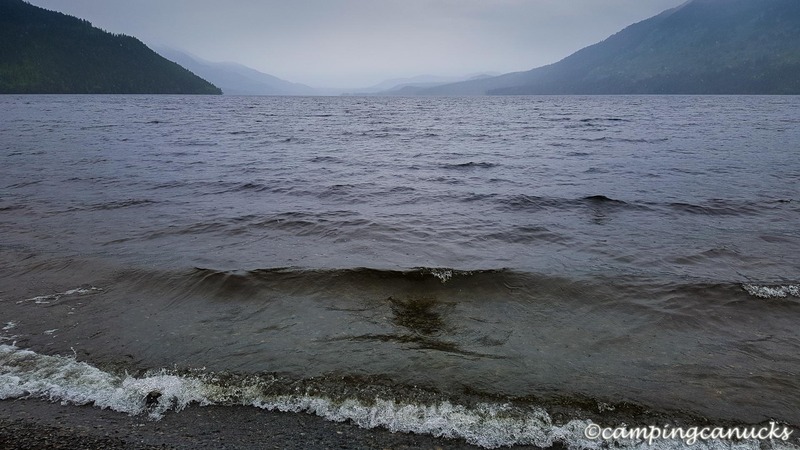 As this lake has no motor size restrictions, bad weather pretty well ensured that almost no one would be out waterskiing or anything like that. And because Mahood Lake is the only lake in the park that is not glacier fed, it gets quite warm in the summer and is a popular place to swim. That said, we found that the lake was quite brackish and not nearly as clear as the other lakes that we have paddled in the park. We would paddle on Mahood Lake again. Perhaps some other time, we’ll come later in the season, such as September, and be able to enjoy a rain and bad weather free canoeing experience on the lake.